We have a winner of the Batcave Toy Room February 2013 giveaway and the winner is Tim Enders . Thanks to Tim and everyone else for playing along. 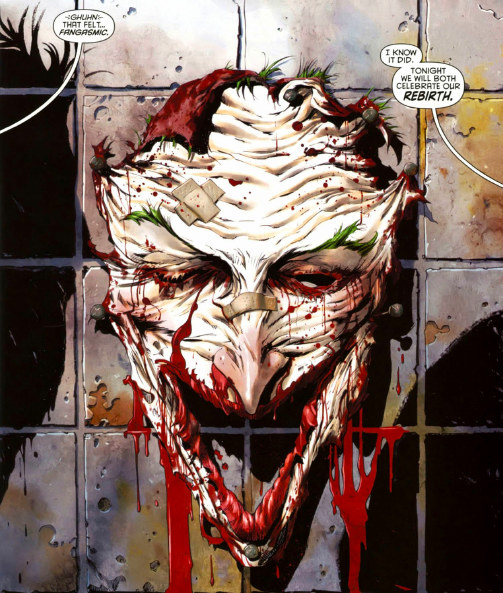 The correct answer to the question of how I started using the phrase "Fangasmic" was from Detective Comics #1 and was spoken by The Joker. I hope Tim enjoys his copy of the Batman: The Dark Knight Returns Blu-Ray/DVD combo pack. This months fangasmic contest had one of the lowest amount of entries then any other Batcave Toy Room giveaway and I'd like to know why. Was the question to hard, you don't have any interest in prizes, or the prize just sucked? Let me know in the comments below. Maybe the Batcave Toy Room needs a rebirth itself. So the question yeah, it was too hard. Sorry sir. It has been so noted. I'll try to make it easier the next time. I don't own a blu-ray player (hides head embarrassedly). It's alright Brian. I didn't get a Blu-Ray player until this past Christmas. Sorry, I guess I didn't make it clearer, but it was a combo pack that included a DVD as well. Congrats to Tim! Glad I didn't win - because I bought the dvd last week so I'd have had to forfeit anyways. And the question wasn't hard at all...with the help of Google ;) But I wouldn't have entered had I not been told by you the set included a dvd, because I don't have a blu-ray player. Maybe that held folks back? I think you may be right. Brian missed out too because he thought it was only in Blu-Ray. I wish I had made it more clear. You Can Just Give All The Prizes To Me. I Think You ROCK.. "Tim E."
Thanks Tim. Stay tuned for the next giveaway.